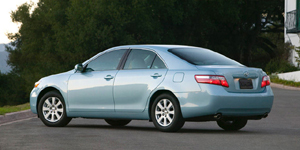 Completely redesigned for 2007, America's best-selling vehicle is better than ever. While it may not be the enthusiast driver's choice, the Toyota Camry excels in reliability and comfort, and has no obvious flaws. A Hybrid-version offers the fuel-economy of a compact in a mid-size dress. For the 2008 model-year, there are no changes at all.